WIFC make the short journey to the north of Hertfordshire to face Stevenage this Saturday, in one of two county-derbies available in the IFA. This will be WIFC’s 5th visit to the Badgers, as the Stevenage fans team are known, and the Internet ‘Orns are yet to record a win. In fact, Stevenage are one of only a few IFA teams that WIFC have never beaten. 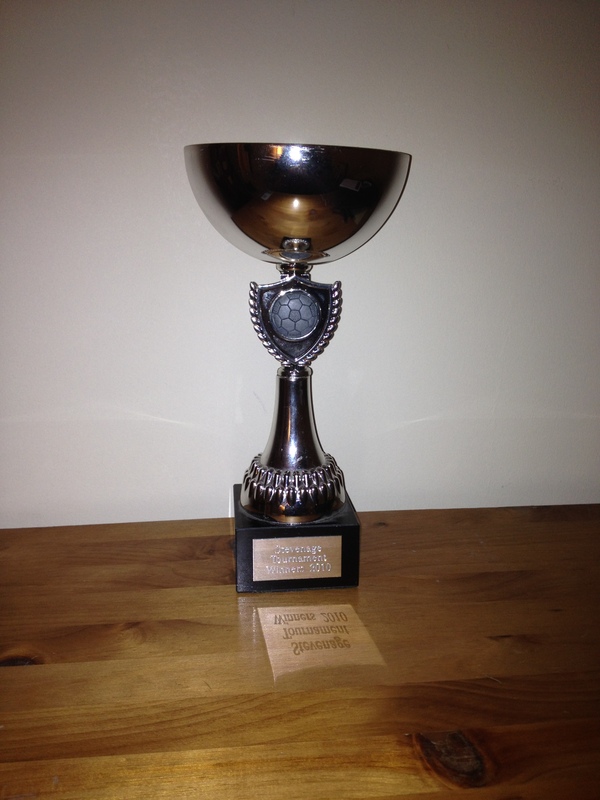 Despite this, the club did win it’s last silverware at the Stevenage tournament, which was held in 2010. Meetings with the Badgers stretch back to 2009 and have always been high scoring affairs. 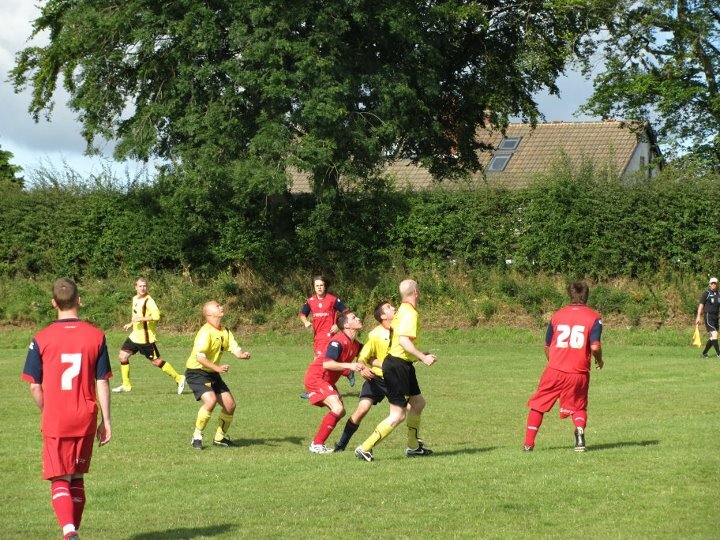 The first fixture in the series ended in a 7-7 draw, with former joint manager Scott Mathers scoring 4, to add to strikes from Jimmy Davis, Chris Dundon and Mat Ball. The only one of the 6 fixtures to be played in Watford followed later that season, with the Badgers taking the spoils in a 5-4 win despite 2 more for Davis and a Paul Whittenbury brace. The last meeting saw WIFC come back from three goals down to grab a late draw in a pre-Worldnet friendly. Alex Prentice started the ball rolling, with late strikes from Stuart Nicholls and Steve Eustice forcing the draw. Scott Mathers, WIFC’s leading scorer in all fixtures v Stevenage, pictured with the man of the match cow after the season opener in Preston two weeks ago. 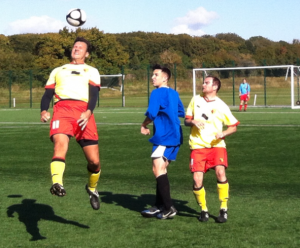 WIFC edged out in seven-goal thriller ! WIFC’s first game of the season, a long distance trek to face IFA league champions Preston, ended in a 1-6 reverse for the Internet ‘Orns but the scoreline doesn’t do justice to the visitors. Having traveled with just 9 men, Preston loaned their striker, Des Wilson, to make an 11v10 game without subs or linesmen allowing WIFC to remain competitive. 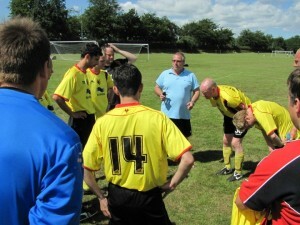 Lining up in a 4-4-1 formation, with keeper Jez Hinds playing as a lone striker, WIFC were under pressure from the off. The whole team worked hard to keep the champions at bay, while always looking to keep the ball, which meant WIFC were able to fashion a few half-chances through Dave Soloway and Moz Clarke. However, the pressure took it’s toll and Preston opened the scoring just after the half hour, adding another before the break. 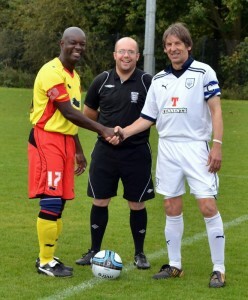 The two captains, Moz Clarke and Steve Cowell. After a swap of loanees, with midfielder Jimmy Atkinson joining the visitors at the break, the second half followed the same pattern. Dogged defending and good use of the ball kept WIFC in the game and further half chances fell to debutant Paul Norgate and Soloway. 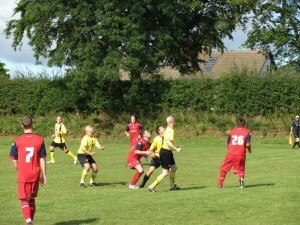 But tired legs and Preston’s good use of the ball finally combined to see Preston rattle in four quickfire strikes. 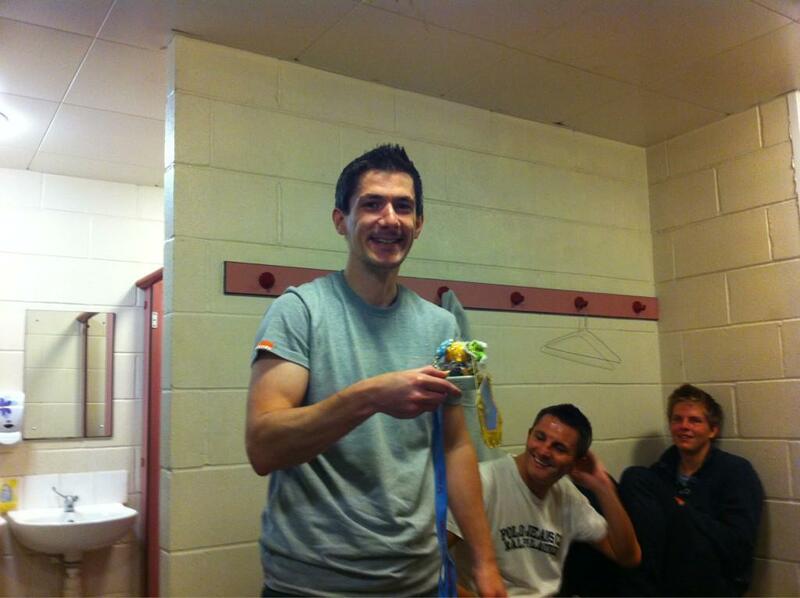 WIFC got some reward for their efforts in the closing minutes, when man of the match Scott Mathers powerfully headed a Norgate corner into the roof of the net. 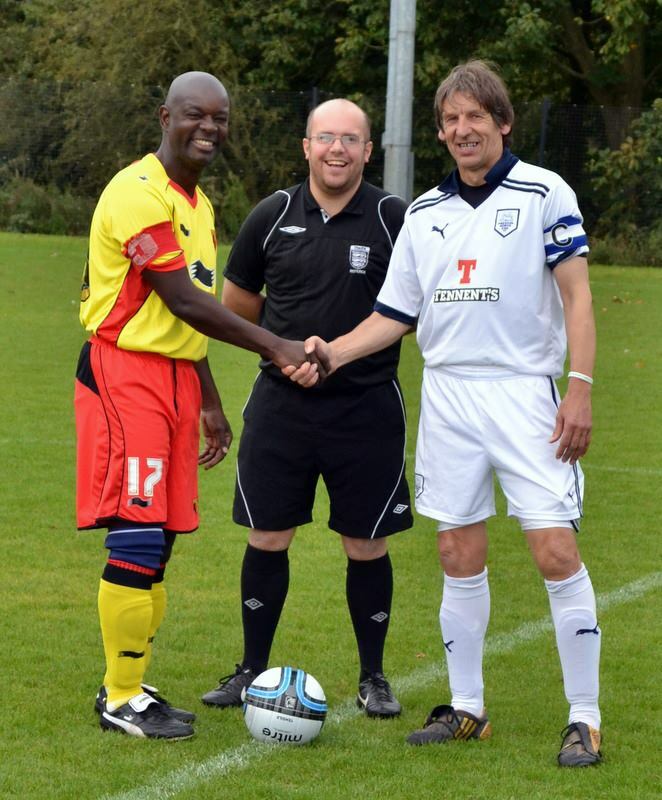 Preston’s experienced midfield campaigner Steve Cowell offered praise to the visitors after the match. 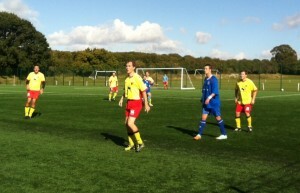 “There was nothing between the two teams for the first 30-35 mins for me” said Cowell. “But the big pitch and lack of numbers finally took their toll on the lads from Watford, but they never let their heads drop and always tried to play their way out of trouble”. Preparations are almost complete for WIFC’s first outing of the 2012/13 season, as the Internet ‘Orns travel to Preston to take on the current IFA League champions before moving on to Bolton for the Watford game this Saturday. As seasonal bows go it couldn’t be trickier for WIFC, but the squad travels in good spirits and keen to get the campaign up and running. 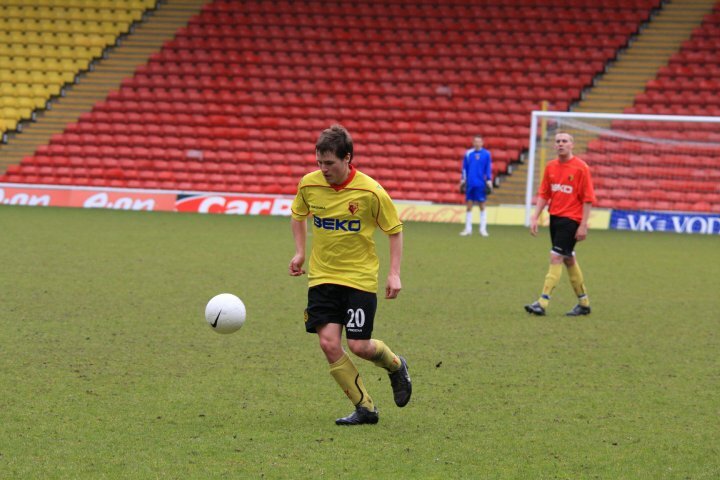 WIFC’s Scott Mathers, due to make a comeback this weekend, prepares to tackle Preston’s Des Wilson in Feb 2008. The game also marks the first match for new WIFC fixtures supremo Phil McBride, and getting the game on is a great start to the new era. “I’m really pleased we’ve managed to cobble a squad together. We’ve missed out on trips to Preston thanks to the fixtures computer sending Watford to Deepdale for midweek games, and their relegation, so the Bolton trip gave us the chance to stop off on route” said McBride. The PNE fans team are one of the most decorated in the IFA, having won their 4th league title since their formation in 2005 last season. Their role of honour also includes 4 IFA Cup wins, 4 North West Cup wins, 2 Team of the Year awards and possibly their finest hour, winning Worldnet in 2008 where they beat WIFC 1-0 in the final. In a classic game. 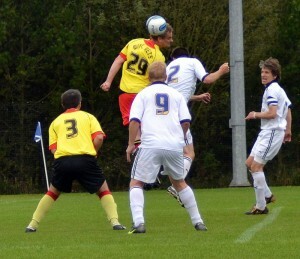 George Pennington gave PNE a first minute lead as the Lilywhites dominated the first period. With some half time inspiring words ringing in their ears, WIFC took the game to Preston in the second half, and thought they had an equaliser when they won a penalty, but the normally reliable Paul Watt skewed his kick wide. The miss took the steam out of WIFC and PNE completed a deserved win, while WIFC wondered what might have been with the impetus of an equalising goal. 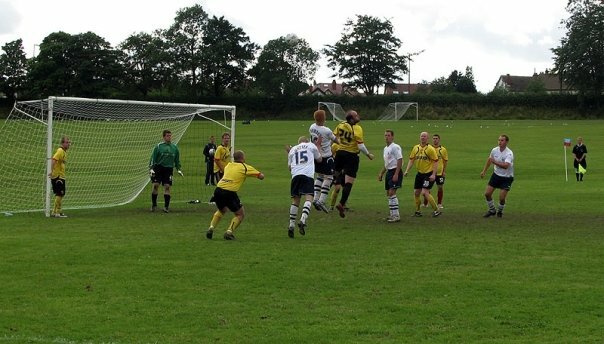 The two clubs have a long history, before and since that Worldnet final, with WIFC providing the opposition for PNE’s first ever IFA league fixture at Queens School in August 2005. 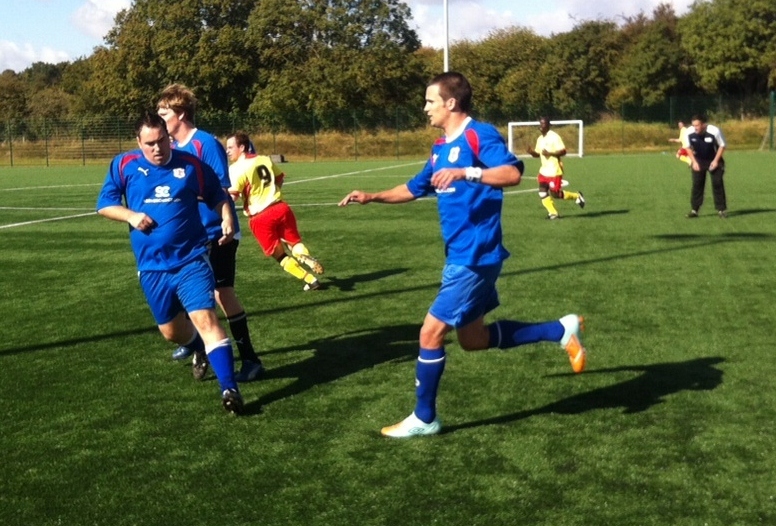 The game ended in a thrilling 3-3 draw, with Paul Whittenbury and a Richard Murphy brace providing the home goals. 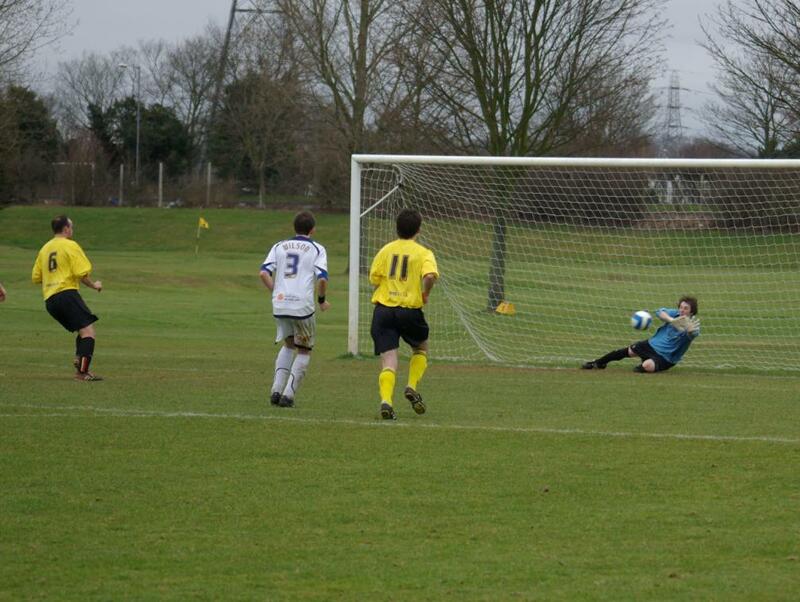 Later that season, a Dave Soloway strike earned a 1-1 draw in WIFC’s only visit to Preston so far. Captains Steve Cowell of Preston and Simon Neill of WIFC before the club’s first meeting in 2005. For each of the following three seasons there were only games in Watford, as the fixtures computer thwarted return trips. PNE grabbed the first win in the series with a 4-1 success in 06/07, while Watford inflicted PNE’s only defeat of the 07/08 season with a 3-1 win thanks to a Paul Watt brace and another Murphy strike. The following season, Preston were comfortable 4-0 winners in the first meeting since that Worldnet final. Paul Watt’s penalty gives WIFC a 3-1 lead in Feb 2008. In the biggest ‘if only’ in WIFC’s history, how different might the Worldnet final have been if Watty had scored that one.. In addition to the Worldnet final, the two sides also met in an IFA Cup Semi Final in 2009, with Preston winning 2-0. 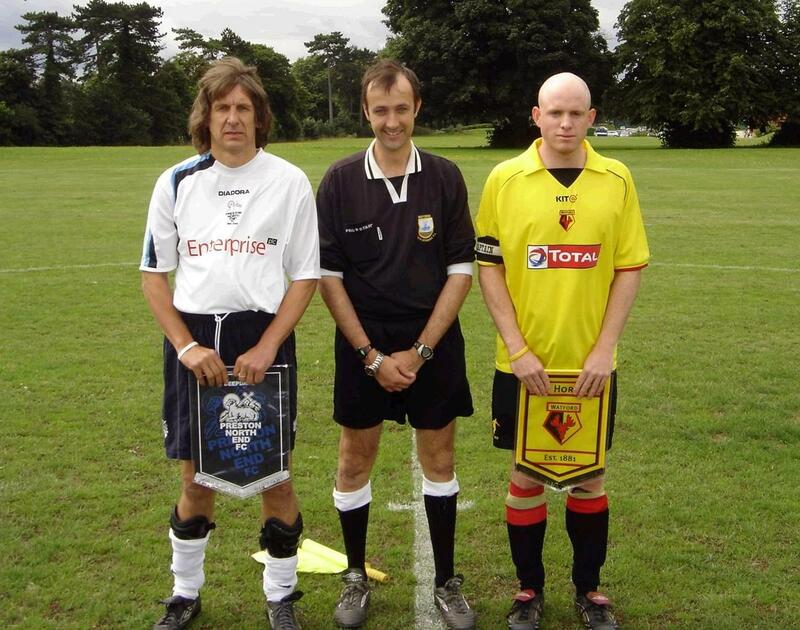 During the 2009/10 season Preston brought both A and B teams to Watford for a double header, with the visitors traveling home with 4-2 and 5-1 wins, while the last meeting between the teams saw Soloway and Jimmy Davis give WIFC a 2-0 Worldnet first round win against Preston’s B team. 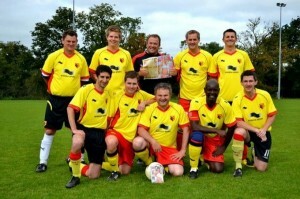 WIFC celebrated 15 years since their formation last weekend. 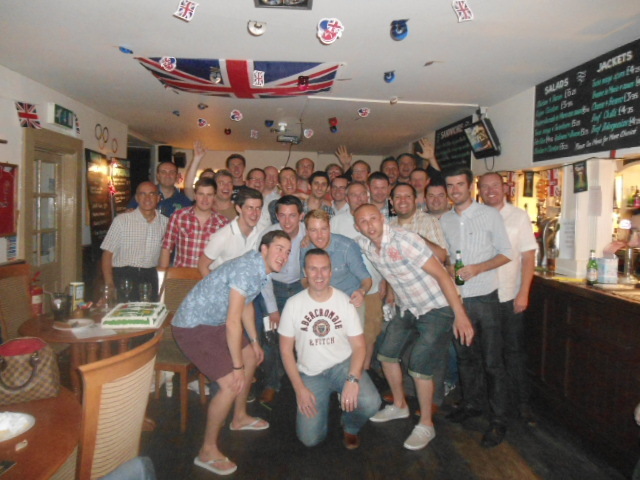 Though the first game actually took place in May 1997, the celebrations were held over until now to enable the club to combine their annual end of season awards with a big drink-up at Druids, their home pub, on Saturday night. More than 50 players, past and present, and partners were on hand to toast the club’s continued success while Watford FC, their sponsors Football Manager, Druids and local author Lionel Birnie generously donated prizes to be raffled for club funds. On the night, the 2011/12 awards were dished out by team manager Chris Davis. Joel Moody added the Players Player award to his already unique double of top appearance maker and top scorer for the season, while Ed Sterry was voted Most Improved Player. 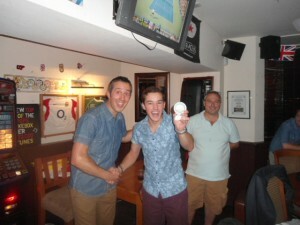 Dan Willis won the Best Newcomer, while outgoing joint manager Dave Messenger won a 4th Clubman gong. Finally, Paul Karlsen joined the select band of WIFC players to join the club’s Hall of Fame. 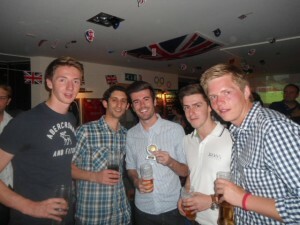 Moody celebrates his award with team-mates Stu Nicholls, Dave Soloway, Rob Stone and jez Hinds. The new WIFC season gets off to an early start this weekend, as the Internet ‘Orns travel to Preston to take on the IFA League Champions for a morning kick-off before travelling on to Bolton for Watford’s fixture later in the day. 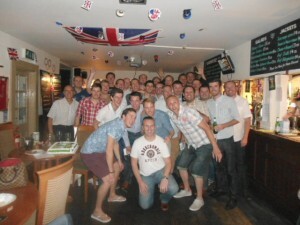 Anyone interested in joining the team in time for the trip can Email [email protected] for more details. Lionel Birnie’s new book, ‘Tales from the Vicarage’ is available to pre-order now – click on the artwork below for more information.